is the use of wires to align crooked teeth and to close gaps between teeth. The best age of starting ortho is after 7-8 years, since many adult dental problems can be avoided by early ortho treatment. Orthodontics, is not limited to children. 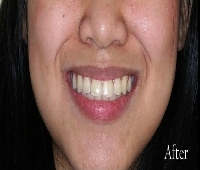 Adults can also have their teeth straightened. Now, with newer technology, the placement of wires is behind the teeth called “Lingual ortho or Invisible Braces”.